A down stroller duvet is great for peace of mind...in any weather from cool summer nights, to blowing cold Canadian winters you can be sure baby will be warm. What a great gift for expecting or new parents. There's nothing more magical than watching a child's delight at the fluttering snow flakes as you stroll comfortably through a snow storm. The only problem is that down stroller duvets can be hard to find and design features are limited. Thankfully there is a bigger selection of synthetic bunting bags that are made specifically for the stroller or have legs for easy fitting. Yes, this is one of those situations where synthetics may out do feathers and down -- not in comfort or warmth but in practicality. When shopping online read customer reviews for an experienced opinion. Wind, water and weather resistant fabric. Three or five-point safety straps that pass directly through reinforced openings that will rest directly on your child. FMVSS (Federal Motor Vehicle Safety Standard) tested and approved. Versatility to go from car seat to stroller or jogger and bike trailer. Easy access when putting in and removing the child, and for diaper changes. Long lasting size range in weight or age to get the maximum use. If you insist on down you will also need a duvet cover, as well as a protective cover to keep your nursery duvets clean and dry. Wet down loses it's ability to create warmth and takes longer to dry than synthetics. But where there's a will there's a way. ... have it custom made or do it yourself using wholesale feathers and down. 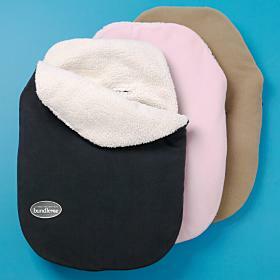 ... buy a Baby Down Comforter 32X49 crib duvet and have it altered to accommodate your stroller. WARNING: Improper use of bedding for babies is a known cause of suffocation. Follow these recommendations we adapted from creative baby-nursery-rooms.com to keep your baby safely at sleep. Crib bumpers are not	recommended. Use a snug fitting baby crib	sheet – there should be no slipping at the corners. Never lay baby on pillows,	or place pillows in the baby crib. Remove soft toys and nursery	duvets when the baby is in the crib. Use a thin and porous	blanket. Soft bedding such as comforters can suffocate infants. Place your baby so his feet	touch the lower end of the crib so that he can't wriggle under the	covers. Tuck the blanket in well on	both sides of the crib under the mattress. The blanket should come no	higher than your baby's chest. Return from this down Stroller Duvet page to the Down Bedding delights home page.